I hope everyone who reads my blog is a member of CGOA (Crochet Guild of America) or at the very least, has some crochet buddies they crochet with on a regular basis. I’ve been a CGOA member since 2002 and I love it! CGOA is a great organization and is getting better all the time. And I’m not just saying that because I’m a Board member now! We’re planning some great additions for CGOA and the CGOA website in the coming years. If you’d like to find out more about CGOA and all that is available to CGOA members, just check out the website at http://www.crochet.org. There will be 2 CGOA Conferences this year: one in Indianapolis, IN in July and one in Charlotte, NC in October. I’m pleased to be teaching 6 classes at the CGOA Conference in Indianapolis in July. I love teaching crochet and I always have a great time at the conference. My students are very eager to learn and I meet so many nice people there, who are also having a great time! It’s almost a week of being surrounded by other crochet enthusiasts and all of us speaking the same crochet language!!! What could be better? I love Mosaic Crochet, Bruges Lace and Wiggly Crochet. I’m so glad that I get to teach them again at the CGOA Conference this year in Indianapolis. To see the full schedule of classes and to register for the conference, visit http://www.knitandcrochetshow.com or http://www.crochet.org/event/KCSRegistration2013. If you’re planning to go to the conference and you haven’t registered for your classes yet, you really should do it soon. Several of the crochet classes are already sold out, including my Mosaic Crochet and Beginning Bruges Lace classes. There are only 2 spaces left in my Intermediate Bruges Lace class and 1 space left in my Crochet Pattern Writing class as of the time that I’m writing this blog post. To see which classes are sold out and if the class(es) you’re interested in taking are close to being sold out, you’ll need to go to the registration page on the CGOA website (https://crochet.site-ym.com/events/register.asp?id=298542). Click on each of the class times to open the drop down menu of classes. That’s where you can see which classes are sold out. Since the registration process is different than last year, you won’t see the sold out classes on the Knit and Crochet Show website like in past years. I hope everyone who attends the conference gets into the classes they want to take the most. 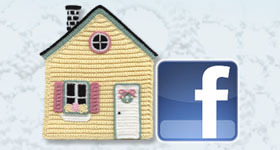 There are some really fantastic classes being offered by 21 knit and crochet teachers. If you’ve never been to a CGOA Conference before, you can even request a buddy to help answer all of your questions and direct you to where the classes are located. 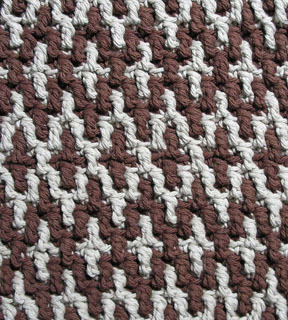 Mosaic Crochet is worked in 2 colors (or more). The color is changed every row or two and some of the stitches are worked in front of the other color in a row or two below the previous row to make the vertical lines. It’s a great technique and really fun to see the pattern come to life before your eyes!!! Lily Chin has a book on Mosaic Crochet called “Mosaic Magic: Afghans Made Easy”. She’s designed some great afghans in Mosaic Crochet in this book. If you’re not familiar with Bruges Lace Crochet, it’s made to look like the intricate Bruges Lace from Belgium. 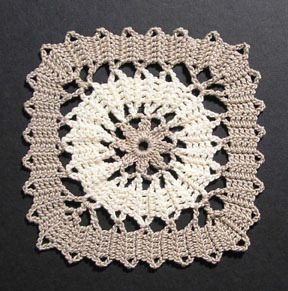 In the crochet version of Bruges Lace, narrow strips or tapes are made, then joined to form circles, squares, triangles and more. The Russians have some really awesome Bruges Lace designs in their crochet magazines. 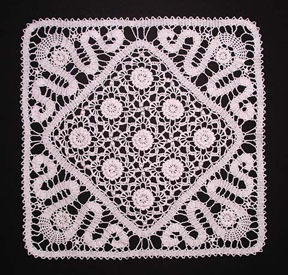 And many Magic Crochet and Decorative Crochet magazines have Bruges Lace designs in them, as well. Bruges Lace Crochet can be combined with traditional crochet techniques, as well, or even with Irish Crochet. I love Bruges Lace and really enjoy designing in this fun crochet technique. I’ve been enjoying the Wiggly Crochet technique for many years. You may be familiar with some of my wiggly crochet designs. This is another really fun technique to learn. I was first introduced to this technique when a friend asked me to crochet a new hot pad for her. Her grandmother had crocheted a wiggly crochet hot pad for her many years before and it had seen its better days! I had never seen wiggly crochet before and was intrigued with it. So I analyzed the stitches and crocheted a new hot pad for her. Then I got to thinking that I could design some Wiggly Crochet hot pads with designs on them instead of just concentric squares, like my friend’s hot pad. So I got out my graph paper and colored pencils and started drawing different shapes until I came up with some designs of my own in Wiggly Crochet. I love the textural, dimensional look to Wiggly Crochet. It is a great technique for hot pads, coasters, rugs and more! You can see all of my Wiggly Crochet designs on my Pinterest board here: http://pinterest.com/susanlowman1/wiggly-crochet-patterns/. I love Wiggly Crochet so much that I have 3 Wiggly Crochet booklets published! And I have a few self-published designs in Wiggly Crochet here on my website, too. 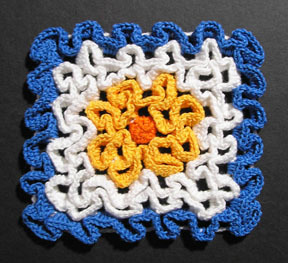 If you’re intrigued with Wiggly Crochet, I hope you’ll give it a try very soon. I love to teach others more about crochet in my classes, whether it’s a crochet technique, learning to read crochet patterns or learning how to write crochet patterns (for new designers). If you’re a new designer and you’re struggling with writing patterns for your designs, I’d love to have you in my Crochet Pattern Writing 101 class. I’m aiming to cover all the bases of pattern writing in this full day class! I’ve been designing and writing crochet patterns since 1999 and I’ve edited crochet patterns for nearly 10 years. I’ve learned a lot along the way and I enjoy sharing what I’ve learned with my students!!! If you’re planning to attend the CGOA Conference and we haven’t met, yet, please leave a comment on this blog post and let me know. I’d love to meet you at the conference this year! I look forward to seeing many friends and making new ones at the CGOA Conference in July. This entry was posted in CGOA, Conferences, Crochet technique, Teaching classes and tagged Bruges Lace, CGOA, classes, conference, crochet, Mosaic Crochet, teaching, wiggly crochet. Bookmark the permalink.